All VDP estates are gathering in the Rheingoldhalle in Mainz and present their new collection to a public of journalists and professionals. The focus is on the entry and mid level wines since most of the top level wines are still bubbling in the cellars. 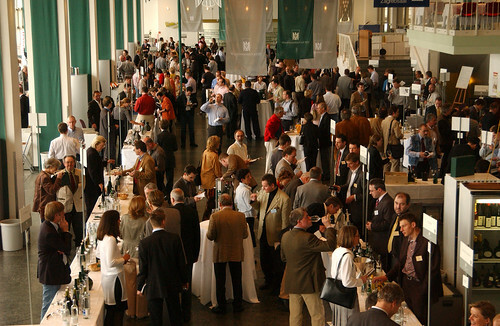 The big challenge at this fair is to deal with a lot of winesthat are still incredibly young, with fermentation notes or yeast tones, even carbondioxide. It is thus very difficult to judge the wines from here, but of course you can get a good overall impression of how the vintage outcome. Weingut Van Volxem, Saar. His basic Schiefer Riesling was the most present, with nice fruit and acidity, all his other Rieslings felt quite closed at that stage, but showed nice potential judging from the acidity and minerality. The Alte Reben still tasted of yeast as it was an unfiltered barrel sample. A taste of the Gottesfuss was also very promising! The sweet Scharzhofberger Spätlese from Reichsgraf von Kesselstadt showed a nice elegance paired with an appealing smokiness that is allegedly typical for this vineyard. Fritz Haag unsurprisingly presented a beautiful collection in his typical clear style with elegantly chiseled acidity and minerality patterns. In the Nahe, the wines of Emrich-Schönleber all seemed a bit closed and acidic to me, but that could also be linked to the youth. Schlossgut Diel on the other hand seemed to have a bit more fruit in his Nahestein and Dorsheim Rieslings. Of course his 2008 Burgberg GG was a big contrast – a wine with weight, balance and finesse. Weingut Tesch once again presented a collection of authentic and genuine Rieslings that let the soil speak for itself. minerality, spiciness and warmth are recurring descriptives here. Martin Tesch is the Bob Dylan of German Winemakers: he lives the craftsmanship ideology and has an unplugged attitude towards things; this can also be seen in his beautiful photobook Riesling People Vol. 1. Dönnhof unfortunately wasn’t present at the fair, so wasn’t Keller which brings us o the next region, Rheinhessen. Fortunately Keller isn’t the only talented winemaker in Rheinhessen. Further down the river, next to Nierstein, St. Anthony and Heyl zu Herrnsheim, the 2 recently merged wineries offer a big and diverse arrray of Rieslings. Their 2009 Rothschiefer is mineral and very elegant. Their 2008 GG Brudersberg is an impressive wine with smoky aromas and a great length. Kühling Gillot also offers a nice range of medium priced Riesling. Qvinterra and Nierstein Riesling as well as Oppenheim Riesling are nice examples of the mineral yet spicy type that are typical for the Roter Hang. Also their First Growth Spätburgunder Kreuz 2007 is notable. It shows beautifully but still needs at least 5 years to mellow from its tannin-loaded status. In the Rheingau I skipped many estates this time. I stopped though at Peter Jakob Kühn‘s booth. He’s somewhat the Rheingau’s Nicolas Joly – all his wines are biodynamic and left to their own fate in the fermentation tank. The style is always matter of fierce debate. Many claim it is not recognizable as Riesling anymore. But what counts is the taste. And if you like this vibrant metallic style that reminds some chenin blancs’ from the loire or some Condrieux’, than you ll probably be a fan of Kühn. His 2009 Hallgartner Hendelberg Riesling is a nice example of his mineral and wild style and shows good weight and balance. Josef Leitz from Rüdesheim presented a very mineral but also light and elegant Rüdesheimer Berg Rottland Alte Reben. I somehow miss this very powerful style of the 2005 wine but he explained that that year was rather exceptional and the vineyard usually delivers more light and elegant wines. At Robert Weil quality was as continuous as ever. The sweet wines were overwhelming in richness and extract but also with the necessary acidity to age years and years. I didn’t taste much in the Pfalz either. From Kuhn I had the Rieslings –Laumersheimer vom Quarzsand and Laumersheimer vom Kalksteinfels which are mineral fresh and creamy, 2 very appealing wines. From the famous Pinot producer Becker in Schweigen I really liked the 2008 Spätburgunder “B” which was elegant and balanced with a subtle vanilla note. But the most enticing reds came from Baden again. Bernhard Huber‘s style is very different from many German Spätburgunders, they’re very finely chiseled and yet with fruit and power. Even the basic wines are appealing but the highlight are definitely the 2 GG Sommerhalde and Schlossberg. Sommerhalde ahs a fresh side with minerality and schlossberg is a much more powerful pinot due to the steep slopes of the vineyard. But also Franken/Franconia has some reds on offer. Rudolf Fürst has a panoply of Spätburgunder but also 2 very interesting Frühburgunder (Pinot Madeleine), those seem lighter and more elegant right now than their big brothers. 2008 Centgrafenberg Frühburgunder is right there on the fruit with nice raspberry notes. The Frühburgunder R has much more weight and tannins and seems a bit more bulky right now (but is still more appreciable than the SB’s in this phase). So that was it! I skipped many many estates. I really wish there was such an event every month, that would make appreciation much easier ;). Overall this new vintage is a true winner with good Rieslings with nice balance across the board. I can’t wait to try the First Growths in September. Wine lovers will have plenty to chose from and that is really good news! He’s one of a kind. We should visit him one day. But it’s true you wouldnt necessarly recognize it as riesling in a blind tasting!